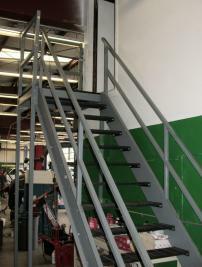 The stairways for this mezzanine system and an additional stairway to access a storage area over the office were custom fabricated from exisitng used equipment to fit the on site dimensions. 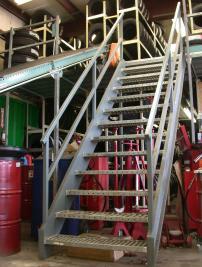 The landings were custom built to fit the space available and designed to fit the tire storage mezzanine system. The mezzanine stairway uses a plank grating tread, while the stairs to the storage area over the office use bar grating treads.